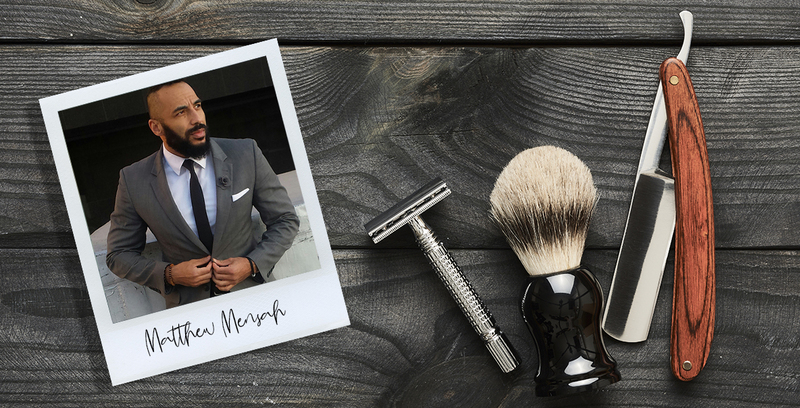 Matthew Mensah shares his men’s grooming secrets and style tips with us. The philanthropist and style icon lets us in on his grooming routine, and it’s not as complicated as you might expect. Follow his guide to feeling fresh and looking sharp all day, everyday. PR extraordinaire, award-winning sartorial figure, campaign strategist, humanitarian, brand influencer for Bvlgari – Matthew Mensah’s resume is impressive! We love that his personal style and grooming are always on point, despite his crazy busy schedule. We asked Mensah to share his grooming secrets. What’s your approach when it comes to male grooming? A man with respect for himself looks after himself, and there should be no excuses. If our female counterparts can manage a grooming routine, so should we. Manicures, pedicures and waxing should be part of every man’s grooming vocabulary. Take us through your daily grooming routine. It's simple; I apply a rich moisturiser with shea butter from Ghana after my shower, brush my hair and beard, check that my nails are clean, and finish off with a great scent. Which three key items are always in your bathroom cabinet? Fragrance, moisturiser and a scissors for my beard. Is there one grooming product you carry with you wherever you go? I have a little miniature bottle of my favourite fragrance that I always carry in my bag, so I can refresh my scent throughout the day. What are your top tips for men who would like to start a grooming routine? Start and end your day by cleansing your skin with a mild cleanser. Find a great barbershop like Bespoke Men in Sandton City, Legends Barbershop, Joburg CBD or La Familia Barbershop in Rosebank. Invest in a monthly manicure and pedicure. Do you have a signature fragrance? Yes, Bvlgari Wood Essence is currently my go-to scent, and it’s so fitting as I am now the official brand influencer for Bvlgari – a dream position as it’s always been one of my favourite luxury brands. Which fragrance family are you most drawn to? I prefer masculine scents with notes of cedarwood, ambergris, fresh citrus and coriander – which actually describes the composition of the Bvlgari Wood Essence fragrance, hence why I am drawn to it! Tom Ford, Paco Rabanne and Gucci Homme are also fragrance houses that produce scents I gravitate towards. Your beard is in impeccable shape, how do your maintain it to ensure it always looks on point? Aah, thank you! Many people don't understand that grooming a beard takes time and effort and you should consider the same approach as you would for your hair. It needs to be washed, brushed and trimmed (or shaven) to create the style you desire. A beard oil is also an essential product that will ensure your beard is keep soft, nourished and smelling good. When it comes to grooming, is it all about the products for you or does healthy eating and exercise also play a big role? Eating healthy and keeping active is very much a part of my routine. I have a bit of a sweet tooth so going to gym is crucial! In 2017 you were named GQ’s Best Dressed Man Of The Year – how have you established your go-to style, and what style advice do you have for our readers? It was such an honour to be given this accolade. When it comes to my style, I have always dressed for myself. I love wearing a suit but I think it’s all about the fit, so I tend to tailor most of the pieces so they fit properly. I then add my own spin on it with interesting shoes and accessories. My advice would be to create your own style and identity, and look at the shape and fit of clothing – not only the brands and price points.